1/24 German Panzer II Ausf. 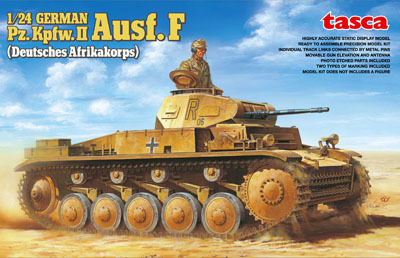 F Deutsches Afrika Korps Model Tank Kit Discounts Apply ! TAS24002 - German Panzer II, Ausf. F Deutsches Afrika Korps, 1/24 scale model tank kit. With Jerry Can rack, extra tool box for North Africa and extra track links for front of hull. The tanks leaf spring suspension has been faithfully reproduced with each spring comprised of 6 parts. Photo-etched metal parts are provided for clamps, the exhaust pipe cover, and the tool box.